The hand lowered with the palm facing outward is the gesture of bestowing blessings or of giving charity. The hand is extended downward, palm out. 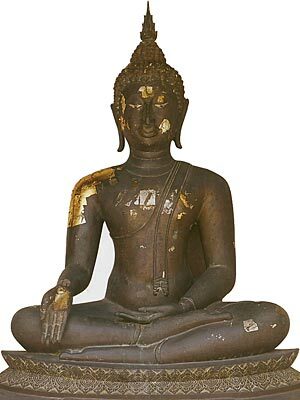 Mostly on standing Buddha images, but sometimes also represented in the sitting position. Original found in Nakhon Pathom. Presently a National Museum Bangkok. Found at Sarnath, Varanasi, India. Original now in the National Museum, Bangkok.